NCAA football, social media, and fandom | Jacqueline Ryan Vickery, Ph.D. The NCAA bylaws have been updated to restrict the ways in which universities (and by extension boosters, fans, and alumni) are allowed to interact with potential recruits via social networking sites such as Facebook. According to rules created in 2006 and updated each of the past two years, “any communication via message boards, chat rooms, walls, comments, blogs, IM, etc. is not permissible. Phone, e-mail and faxing are the only acceptable forms of direct communication with recruits, with restrictions placed on how many times a school representative can initiate the contact. And the NCAA uses a broad definition of “representatives of a university” – in addition to coaches and athletics staff, it also includes boosters, season-ticket holders, alumni, donors and even current students, according to Stacey Osburn, the NCAA’s director for media relations. Interestingly this means seemingly innocent Facebook groups about a particular player are not allowed, especially if the recruit is currently uncommitted. I think it is interesting to consider the ways in which the NCAA is responding to social networking sites, but equally as interesting to consider the expanding definition of “booster” which basically just means “fan”. In a preemptive move to protect themselves and their fans, the University of Oklahoma has published guidelines of appropriate and inappropriate fan behavior on social networking sites. I’m sure other schools are doing this as well. Certainly it is becoming increasingly difficult to regulate and enforce such policies, especially when the guidelines not only apply to coaches but to individual fans. Fans have always had an emotional and personal investment with their teams and to a certain degree have always felt a sense of “ownership” of the team. Recent controversies with the BCS have provided fodder for fans to exercise their “rights” to influence and govern their teams. 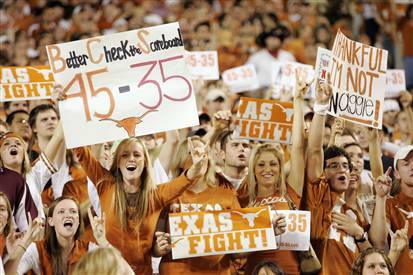 When the Texas Longhorns failed to secure the Big XII South title (and therefore a chance to play in the Conference and National Championships), fans did not just feel as though their team had been cheated, but rather felt that they personally had been cheated. This led to a lot of politicking and lobbying from fans on behalf of the team, both online (such as the 45-35 Facebook group which still boasts over 60,000 members) and offline (such as the 45-35 plane planner). 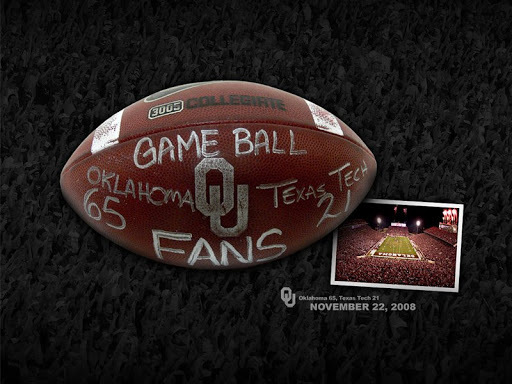 Coaches and players also acknowledge their commitment to the fans, for example when they dedicate a game ball to the fans as was the case in the OU/Texas Tech game in 2008. Or when they acknowledge a sense of obligation they have to the fans, for example by apologizing not only to the team, but also to fans after a disappointing loss (think Tim Tebow’s overplayed apology after the Ole Miss loss). Fans identification with their teams is nothing new, in fact it is an inherent part of fandom, but what is changing are the ways in which fans can interact with their teams, the players, the coaches, and each other. New media technologies such as blogs, Twitter, chat rooms, and social networking sites serve to diminish the gap between fan and team. I believe with the increasing level of intimacy comes a greater sense of fans “ownership” and investment. As such, it is not surprising that greater investment is likely to lead to greater control and policing of fans’ behaviors (inappropriate contact with a recruit could mean a fans’ season tickets are revoked), as well as players’ behaviors on such sites. One extreme example is the case of the Texas player who was dismissed from the team because of a remark on his Facebook account. Placing restrictions on the ways in which coaches can communicate with recruits (as well as the frequency) is a necessary policy, but in our contemporary media environment it is increasingly difficult to actually regulate what constitutes “recruitment” and “communication”. A Trojan friend of mine recently alerted me to Pete Carroll’s blog, which he described as, “an outright recruiting tool masked as a ‘fan’ site”. 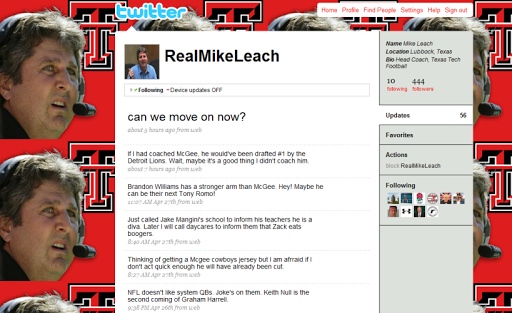 Several NCAA coaches also have Twitter accounts (Pete Carroll and Mike Leach update on a frequent basis) where they send updates about practices, pep talks, interviews, games, etc. Seeing how Twitter is not considered “private” communication, I’m guessing it falls outside of NCAA’s recruitment regulation. In a media environment which continues to blur boundaries between public and private, it becomes ever more difficult to actually regulate and enforce policies intended to restrict communication. It will be interesting to see the ways in which fans continue to interact in a more personal manner with coaches, athletes, and other fans. As with all new mediated technologies, new challenges will arise which regulations have yet to address. Policies are always a few steps behind behaviors and in an environment in which fans have an increasing sense of ownership over their teams, I think it will become more difficult to actually regulate interactions between coaches, (future) players, and fans. Excellent points, and well stated!